Sea vegetables contain iodine and other nutrients essential for thyroid health, fertility, and detoxification. 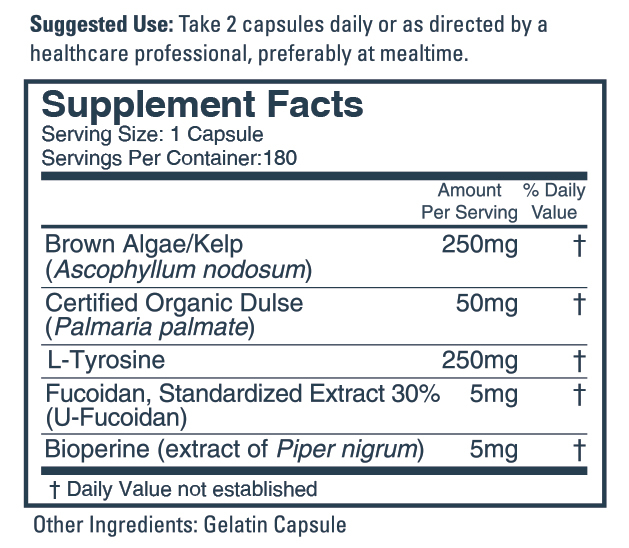 Fucoidan, found in small amounts in the cell walls of brown algae and dulse, is an especially important component, regulating thyroid function, inhibiting the growth of many unfriendly bacteria and viruses, and enhancing immune function. A healthy thyroid makes just the right amount of hormone – not too much, not too little – from iodine and the amino acid l-tyrosine. Thyroid hormones in turn regulate the metabolic activity of every cell in the body, profoundly effecting how we feel and function. Sea Vegetables Plus combines brown algae and kelp concentrate, rich in alginate and laminarin, with dulse, l-tyrosine, and fucoidan extract.